Global threat detection systems market is anticipated to grow with an attractive CAGR of 13.18% during 2016 – 2023. Major drivers which are enhancing the global threat detection systems market are augmented demand for enhanced security, growing demand for large-scale surveillance systems, upsurge in acts of terrorism across the globe, increasing territorial conflicts and geopolitical instabilities and government regulations for security devices. Moreover, increasing demand for biometric systems from consumer electronic devices and commercial establishments and upgrading existing infrastructure with advanced systems are one of the opportunity factor which will impact the overall market of the threat detection systems market. Apart from this, high cost of threat detection systems and concerns over intrusion of privacy is impacting negatively to the threat detection systems market worldwide. The threat detection systems market is segmented on the basis of product, detection type and application. On the basis of product is subdivided into explosive and narcotics detectors, personal radiation detectors (PRD), dosimeters, survey meters, identifiers, photo-ionization detectors (PID), air samplers, chemical agent detectors, biological agent detectors, laser systems, radar systems, video surveillance systems, perimeter intrusion detectors, wide-band wireless communication systems, biometric systems, and others. On the basis of application is subdivided into defense, public infrastructure, commercial places, industrial, institutional, and residential (home surveillance). On the basis of detection type market is subdivided into explosive detection, radiological & nuclear detection, chemical & biological detection, narcotics detection and intrusion detection. 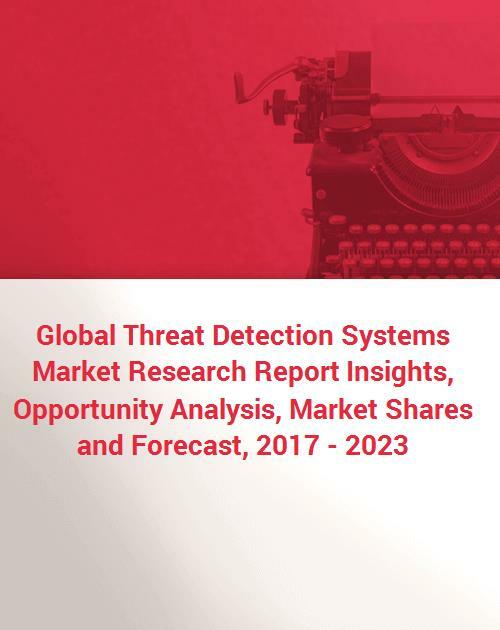 On the basis of geography, the global threat detection systems market is segmented into four major regions such as North America, APAC, Europe and RoW. Currently, North America is accounted to be the largest market share for Threat detection systems market due to constant increase in the research & development activities, particularly in high-energy laser system technologies and participation of numerous companies such as FLIR Systems Inc., Mirion Technologies Inc. and many more. Apart from this, Asia-Pacific is the most significant high growth market due to increasing territorial conflicts and geopolitical instabilities and upsurge in acts of terrorism across the globe which is anticipated to urge the growth of threat detection systems in this region. Many key manufacturing companies are engaged in the threat detection systems market are Smiths Group PLC (U.K.), FLIR Systems Inc. (U.S.), Safran S.A. (France), Thales S.A. (France), RAE Systems Inc. (U.S.), Rapiscan Systems Inc. (U.S.), Chemring Group plc (U.K.), Mirion Technologies Inc. (U.S.), ChemImage Sensor Systems (U.S.), and Axis Communication AB (Sweden), among others. New collaborative developments and new product innovations are some strategic initiatives taken by the industries to retain oneself in the competition.